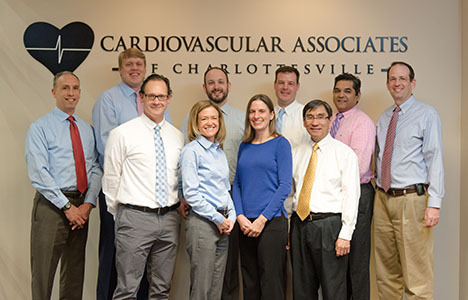 Cardiovascular Associates of Charlottesville was established in 2007 to serve the cardiovascular needs of patients in Charlottesville and Central Virginia. Our mission is to provide quality, state of the art, patient-centered cardiovascular care to patients within the Sentara Martha Jefferson Hospital network. Services available through our practice include all aspects of outpatient consultative services, echocardiography, nuclear cardiology, cardiac catheterization and interventional cardiology services, as well as inpatient care through our affiliation with Sentara Martha Jefferson Hospital in Charlottesville. Our eight physicians are Board Certified in Cardiovascular Disease, Interventional Cardiology and Cardiac Electrophysiology. Working with Sentara Martha Jefferson Hospital, our team provides seamless and quality care. Patients can expect prompt care and to be seen by cardiologists they know and trust when receiving services within the hospital. Sentara Martha Jefferson Hospital is a not-for-profit community hospital serving Charlottesville, Albemarle County, and the surrounding counties in Central Virginia. Sentara Martha Jefferson Hospital provides comprehensive medical and surgical services.